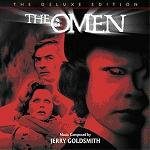 "The Omen" is one of those unmistakable soundtracks, which for sheer evil presence has never been equalled. The original album of the soundtrack was highly praised on its release, and to celebrate the 25th anniversary of the movie this Special Edition considerably expands the original album to include a number of new tracks - tracks 2, 4, 5, 6, 12, 15 and 17 have not been previously released. The film itself, though it had a few big names in its cast, was nevertheless relatively low in terms of budget. In order to secure Jerry Goldsmith's services for the soundtrack, a funding extension was requested and approved by 20th Century Fox. And was this the right decision! Goldsmith produced one of the finest scores of his long and illustrious career, winning his first oscar in the process, and setting a standard in the musical portrayal of evil for future composers to aspire to. Goldsmith chose to base the music around the idea of a black mass, a dark twisted version of the traditional mass as previously used by many classical composers. Instead of worshipping Christ, the disciples at a black mass pay homage to the Anti-christ (in this film a young boy called Damien). The use of voices on the soundtrack conveys the eerie feeling that there are many followers of Satan among us. The main title track is the key to the whole work, Ave Satani in latin means "Hail Satan" as his disciples welcome the return of their master as told in the Book of Revelations. The music is positively absorbing and unsettling at the same time. Sometimes atonal but, where a key is present, it is a dark minor key with frequent dischords which refuses to conclude on the tonic note but instead rises on a crescendo of increasingly hysterical chants. This and related themes and effects are used for the darker moments in the film where diabolical deeds are in progress. In complete contrast to this, there is a "Love Theme" for Damien's step-parents and the brief moments of normal family life which they enjoy. The film and music plays with us, by showing these moments of happiness and enjoyment, before reminding us that evil events are not far away. It is the interplay between these two themes, good and evil which make the soundtrack highly effective. It is difficult to single out any particular tracks, since a complete listening from start to finish is the best way to savour this album. Nevertheless there's some hair-raising music to accompany the particularly grisly episodes of the film where opponents are attacked or killed, including The Killer Storm where the priest played by former Doctor Who Patrick Troughton is speared, Beheaded where the photographer is despatched and The Fall where young Damien on his tricycle knocks his stepmother (Lee Remick) over the banister resulting is her miscarriage. There is the Safari Park incident which first hints at something not quite normal about the boy, and The Demise of Mrs. Baylock where Billy Whitelaw as the boy's nanny and faithful protector launches a frenzied attack on the stepfather (Gregory Peck) to protect the boy. There are other moments which rather than going for big shocks are there to tell the story of the boy's background ranging from darkly mysterious to ominous like On this Night, I Was There, and 666. The New Ambassador is the first statement of the Love Theme introducing us to Gregory Peck. This theme becomes a sad lament in A Doctor, Please, A Sad Message and The Bed and the interplay between good and evil comes out on tracks like Where is he?. Jerry's wife Carol wrote lyrics for the love theme which weren't used during the film but included on the original album as well as the special edition in The Piper Dreams. The Deluxe Edition is nicely put together by the prolific and ever-reliable soundtrack producer Robert Townson for Varese Sarabande. Townson has worked with Jerry Goldsmith many times, and also contributes the informative accompanying notes. The music is performed by The National Philharmonic Orchestra conducted by the head of music at Fox, Lionel Newman. It is a "must have" for any serious soundtrack collector and bears many a repeated listening. The album can be found at: Amazon.co.uk in the UK, or Amazon.com in the US. See also our review of The Omen's sequel Damien: Omen II, the Deluxe Edition.